1. First-round pick Rashaad Penny impressed as a pass-catcher. Rashaad Penny led the nation in rushing last year, piling up 2,248 yards and 23 touchdowns for San Diego State, and while the Seahawks made him their first-round pick in large part to help the ground game, Penny also showed this weekend that he can be a weapon in the passing game as well. While pass protection wasn’t one of Penny’s strengths in college, Carroll is confident they will get the running back up to speed in that element of the game. Carroll praised quarterback Alex McGough after Day 1 of rookie minicamp, calling him “one of the surprises of the day” and the seventh-round pick out of Florida International University only continued to impress over the next two days, showing a strong arm, mobility and accuracy on the move. It’s still very early in the process, but so far the move from safety to cornerback is going well for Tre Flowers, a fifth-round pick out Oklahoma State. While Flowers appears to have all the physical traits the Seahawks like in a corner, he still has to learn the position, and as Carroll explained, the biggest part of that is having the discipline to play the position the right way. 4. Carroll’s thoughts on defensive ends Rasheem Green and Jacob Martin. While it can be tough to evaluate offensive and defensive line play during a minicamp practice without pads, Carroll has seen positives out of the two defensive ends the Seahawks picked last weekend, third-round pick Rasheem Green and sixth-rounder Jacob Martin. “Rasheem, I think I said it the other day, you could see after the first day that he’s really well coached,” Carroll said. “You could see that he’s got a real sense for rushing the passer. His movements and kind of his transitions in and out of his movements—he’s an experienced kid for a 20-year old. So that means he’s been coached really well and he’s a good natural athlete. It’s really obvious in the camp. He looks like he would have a chance to do what we need him to do. It doesn’t look like he has a million miles to go. That was real exciting." 5. Shaquem Griffin “looked very comfortable, very natural” at weakside linebacker. 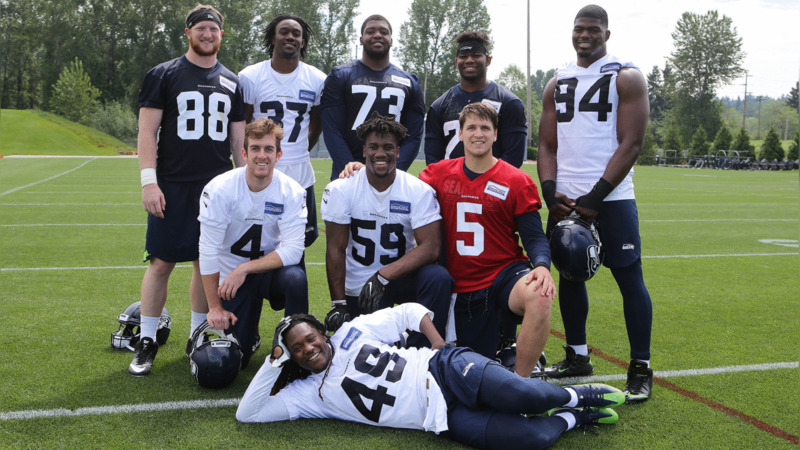 Carroll joked that on Day 1 of minicamp, linebacker Shaquem Griffin was going so hard, they had to “chill him out a little bit.” Overall, however, Griffin had a good first weekend playing weakside linebacker. 6. Cyril Grayson Jr. and Tyrone Swoopes have made progress since their rookie seasons. While the majority of players on the field this weekend were rookies, there were a few players on the field who had a bit more experience, a group that included receiver Cyril Grayson Jr. and tight end Tyrone Swoopes, who were both eligible to participate this weekend because they spent last season on the practice squad and not the active roster. Swoopes was in a somewhat similar situation to Grayson last year, having a bigger learning curve than a typical rookie. While Grayson was playing catchup because he didn’t play college football, Swoopes had to learn a new position, making the move from quarterback, his position at the University of Texas, to tight end.